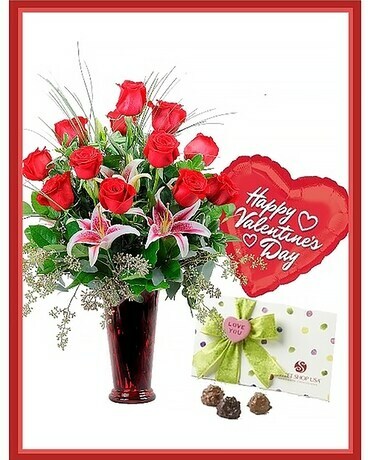 Sweetheart Spectacular in Bonita Springs FL - Heaven Scent Flowers Inc.
Our most popular rose design for Valentine's Day is a vase filled with a dozen premium long stemmed roses, sparkling LED lights and fragrant stargazer lilies with a variety of specialty foliages. This Sweetheart Spectacular comes with a box of chocolates and Happy Valentine's Day balloon. This package will Knock Her Socks Off!